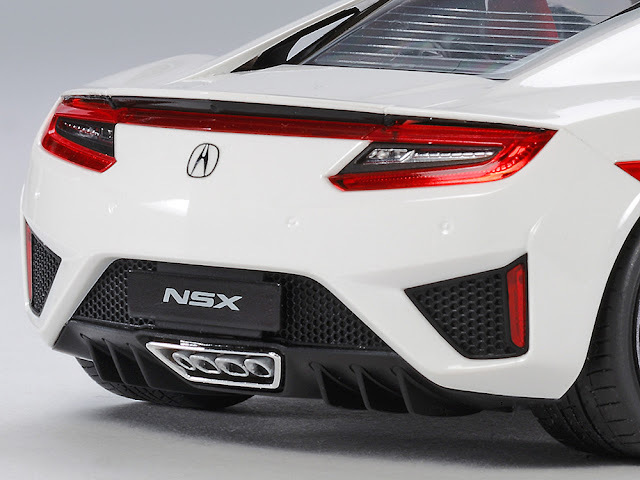 A GRINNING SHARK'S-MOUTH GRILLE marks out the latest Honda NSX to hit the streets. 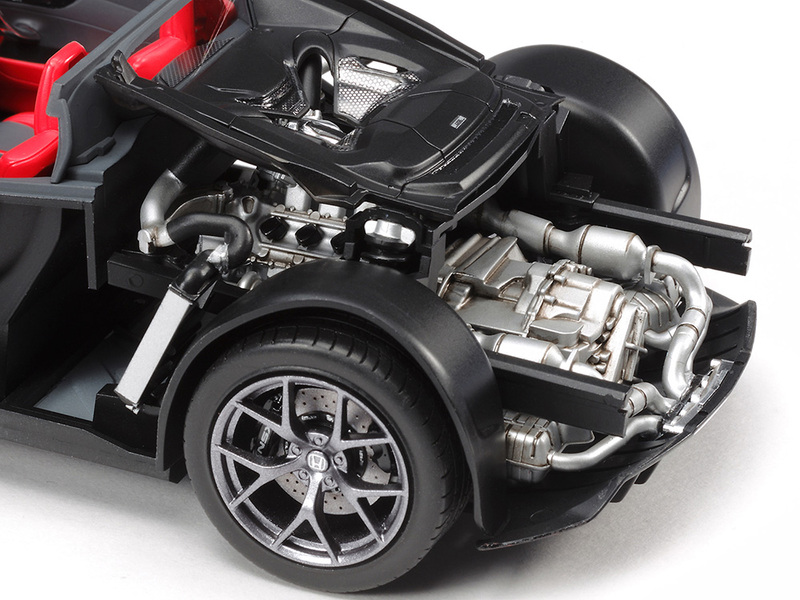 And Tamiya marks the entry of this Japanese supercar with a 1:24 scale replica. SMN report: The new NSX has a body made from a combination of lightweight materials such as aluminium, steel and carbon-fibre. Power comes from a mid-mounted V6 engine, linked to a system that uses three electric motors for maximum wheel control, especially in corners. The Tamiya kit (below) is well up to the company's high quality tradition, and has plenty of internal detail inside that curving bodywork. The V6 twin-turbo engine (below) is precisely moulded, and sits amidships between the rear wheels. Note the engine's metallized finish, and the gunmetal colour of the lightweight wheels. 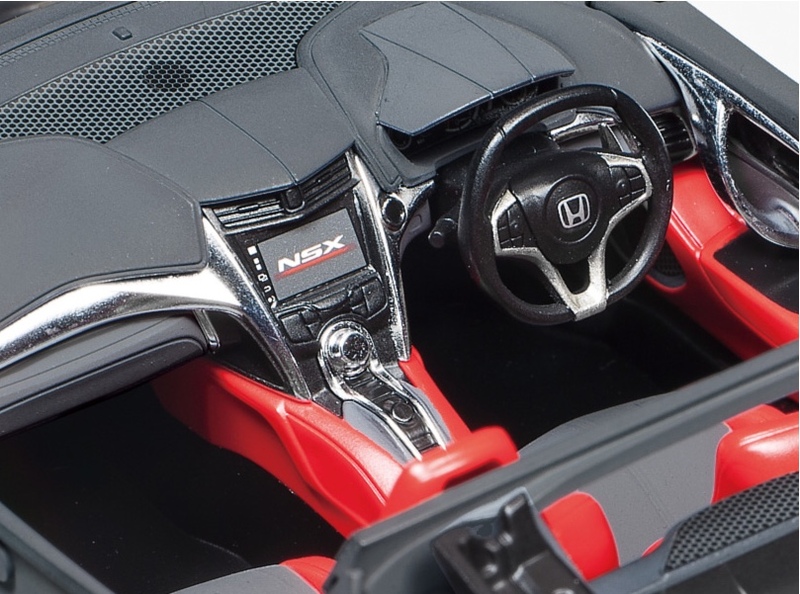 Complex forms of the Honda NSX nose section (below) are neatly produced in the kit. A mixture of metal-plated and clear parts are used for the various head and tail lights. Note the drilled disc brakes. 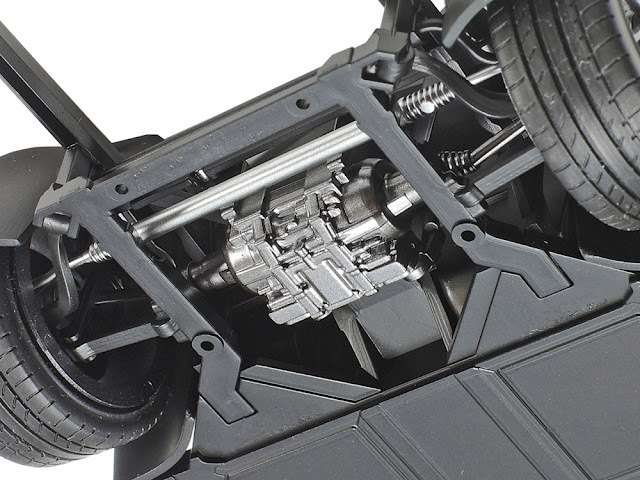 The car can be assembled as a left- or right-hand drive version (below). 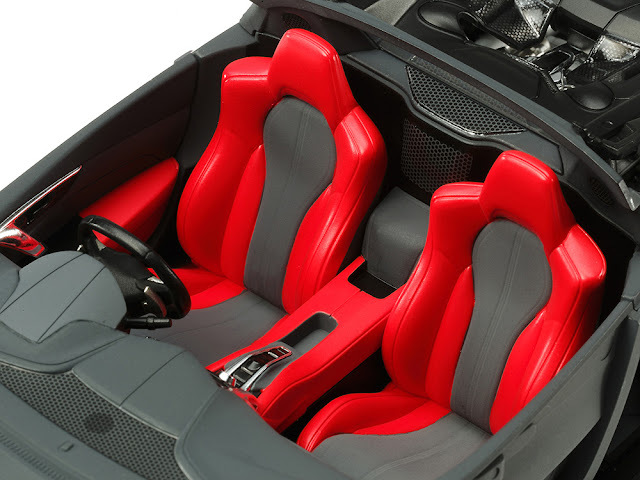 Here the car is shown as it would be used by drivers in countries such as Australia, India, Japan, South Africa, and the UK. Neat cockpit (below) includes the futuristic NSX seat cushions, items that could easily be standard issue on a starship flight deck in almost any sci-fi movie. Tamiya has included metallic stickers for the badges (below) at front and rear. 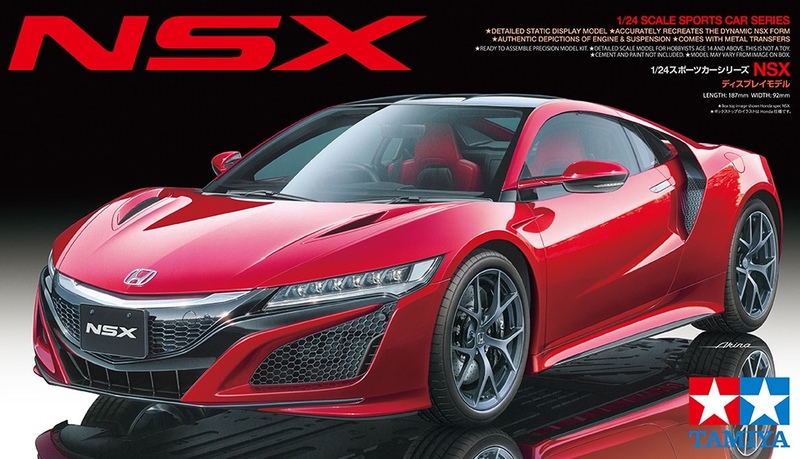 Most countries receive the NSX badged as a Honda, but in the USA the car is marketed under the Acura brand name. Don't ask us why that's the case: you need ask the Honda PR suits, who doubtless have a bunch of reasons that sound good, if only to other wonks eager to make their way up the corporate ladder. Suspension and other details (below) are beautifully modelled by Tamiya. Guard plates (below) hide many of those technical components. 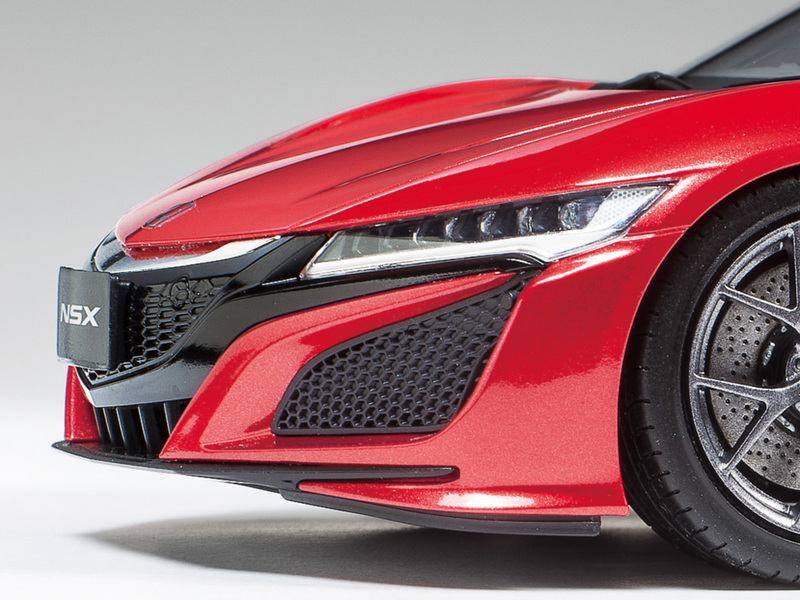 So we reckon there's a good case for a second Tamiya NSX, its aim to maximise the visible detail. We'd love to see a transparent body and floor pan included for that very purpose. Perhaps a half-and-half painted and clear body would be ideal. The finished model (below) assembles to make a highly realistic miniature. Doubtless there will be plenty of diecast competition to come, especially in the smaller 1:43 scale. We'll have to wait and see if other injection kits are released, though we doubt they will outdo the general excellence of this Tamiya production. 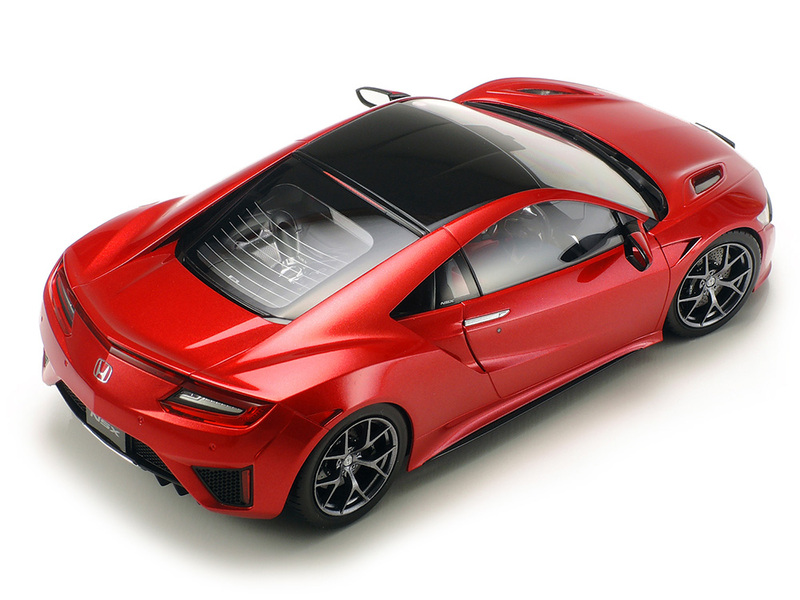 Three-view art (below) shows NSX body styling, typical of the current generation of Hondas. 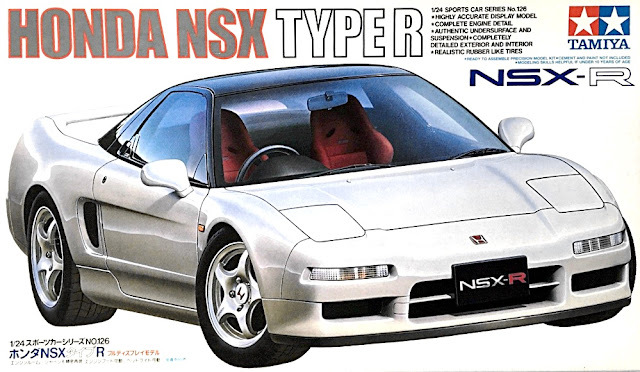 The latest NSX is not the first Honda - or Tamiya model - to bear the name. The first NSX was an elegant beauty, sold from 1990-2005. 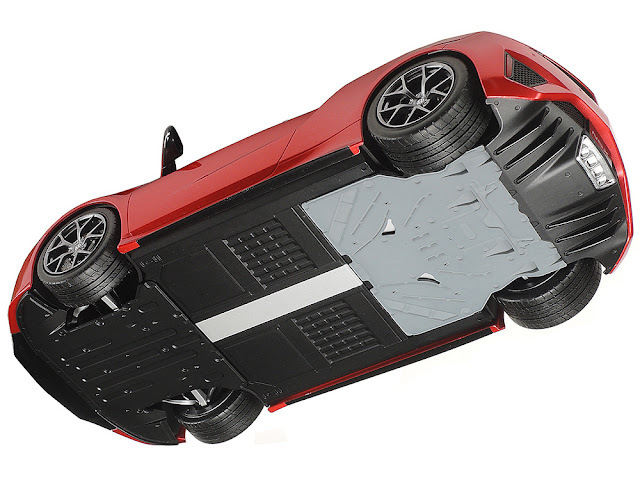 Tamiya has released both the original NSX in 1:24 scale, as well as the uprated NSX-R track version (below). A nicely detailed kit of a Japanese sports machine, produced in the typically excellent Tamiya fashion. 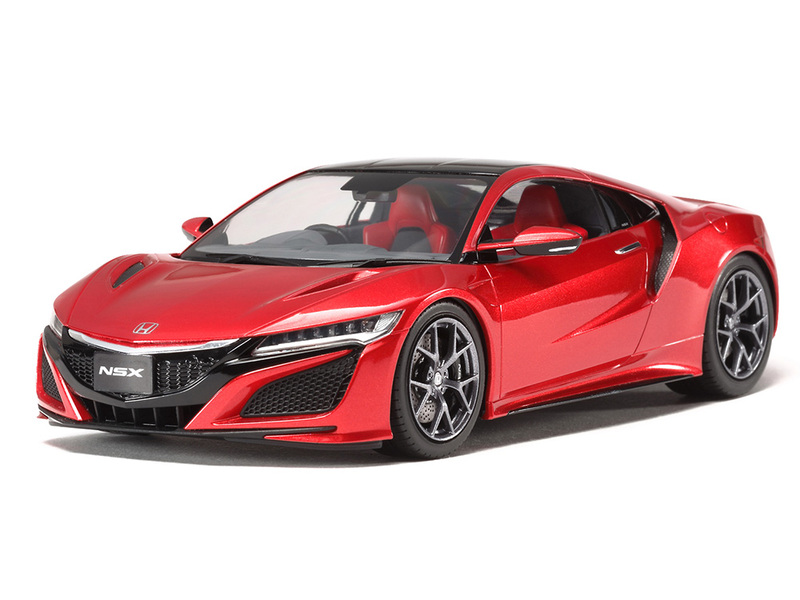 The kit is well worth adding to your performance car model collection, and even better if you have it displayed next to a first-generation NSX and/or NSX-R. Which body style wins the good-looks award? Your choice!